For almost 20 years, I fed my family the best of the healthy whole grain foods: Fresh whole wheat bread. Baked from freshly ground, organic whole wheat flour. The aroma was delightful. 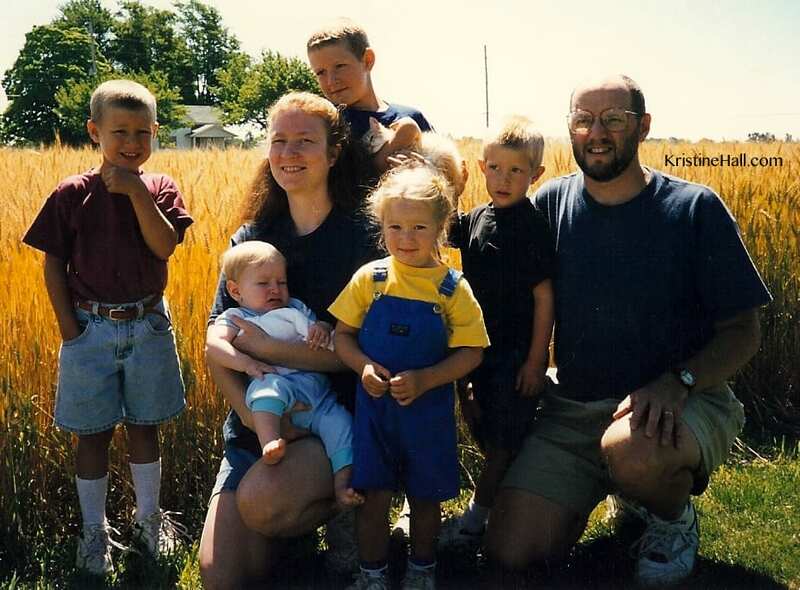 In fact, this family photo (from 1997) was snapped in front of a picturesque field of ripe wheat. Last fall, my husband and I listened to the audio book, Wheat Belly, while driving on a long trip. Our lives haven’t been the same since. Recently, when my niece, Elizabeth, asked why our family preferred to eat gluten-free, I didn’t have a good answer ready. I mentioned a few benefits we had observed such as better sleep, better blood sugar control, and clearer thinking. But I forgot to list others such as relief from joint pain and the elimination of menstrual pain for my daughter. Elizabeth’s question is crucial for any significant life change. Without a big enough ‘why’, a person is less likely to achieve their goal. Any goal. A search on YouTube for ‘the power of why’ returned over 84 million results. We appear to know intuitively that change won’t happen without a really good reason why we need to make that change. I knew that I needed to have a better answer. A bigger WHY. Not just for Elizabeth, but for myself and my family. This resource will help me formulate a bigger WHY. In his newest book, Wheat Belly Total Health, Dr. William Davis provides a well-documented explanation of why eating grains may have a negative effect on everyone, not just those with digestive complaints. He discusses the role of grains throughout human history and makes a very strong case for eliminating grains completely. Part 1: No grain is a good grain. Here is a very thorough explanation of the science of why grains are not good for any human. Part 2: Living grainlessly. Grains are addicting and here Dr. Davis shares how to break that addiction and change our eating patterns. Part 3: Be a grainless overachiever. This is roughly half of the book. This is where general nutrition, fitness, sleep, etc. are discussed. 1. All grains raise blood sugar and provoke glycation, an irreversible process which leads to conditions such as cataracts, hypertension, arthritis, kidney disease, heart disease, and dementia. For many years, nutritionists told my son with type 1 diabetes to eat healthy whole grains. Yet 2 slices of whole wheat bread raise blood sugar more than 6 teaspoons of table sugar. And a 1-cup serving of organic cooked oatmeal contains 50 net carbs, the same as 11 teaspoons of sugar. Clearly those nutritionists were not helping him achieve optimal health. 2. Grain consumption destroys gut health. The impact of grains on gut health is very complex. Dr. Davis devotes an entire chapter to this topic. Grain consumption contributes to nutritional deficiencies and changes in bowel flora. But a very insidious effect is abnormal intestinal permeability, known more commonly as leaky gut syndrome. 3. There is a direct link between grains and autoimmune diseases. This topic is also very complex. In fact, an entire online Autoimmune Summit will be taking place in a few days. Some of the speakers will be addressing the connections between grains and autoimmune diseases. Dr. Davis highlights a recent study by Dr. Alessio Fasano confirming this link.”We now have a direct path linking gliadin and related grain prolamin proteins with autoimmune conditions. This sequence of events is not limited to people with celiac disease or gluten sensitivity; this applies to everyone. Susceptibility will vary based on genetic factors, but it is separate and distinct from the gastrointestinal disruption caused by celiac disease. The list of autoimmune conditions attributable to wheat is staggering. 4. Grains make us fat. It is not simply a matter of keeping the calories consumed less than calories expended. a. Gliadin-derived opiates stimulate appetite for more grains and sugars.This is especially true for wheat, rye and barley. To some extent corn also. b. The amylopectin carbohydrates of grains raise blood sugar to high levels which results in a cascade of hormonal disruptions. This leads to a buildup of visceral fat which continues the cycle of hormone disruption. c. The lectin of wheat, wheat germ agglutinin (WGA), mimics the effects of insulin on fat cells and blocks weight loss. The lectins of rye, barley and rice have the same properties and are included in the term WGA. 6. Grains have numerous negative effects on your brain. As many parents have observed, emotional behaviors and moods can be caused or amplified by grains. 7. “Healthy whole grains” should be called “heart-disease-causing” grains. This list of takeaways forms the core of my ‘WHY’ for changing the way my family eats. 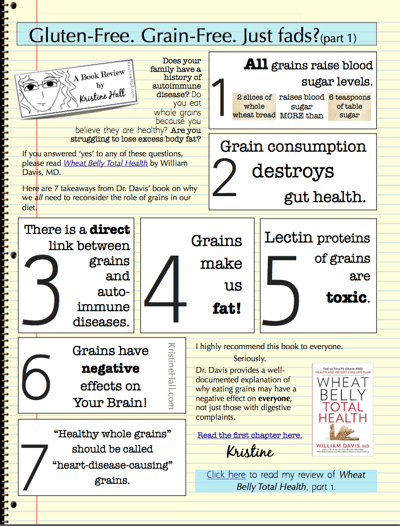 If you haven’t read Wheat Belly Total Health, I strongly encourage you to read it. Now. The first chapter is available to read for free here. Here are 7 takeaways from Dr. Davis’ book on why we all need to reconsider the role of grains in our diet. Please download this one-page printable to share vital information with those you love! November 4, 2014 in Book Reviews.